Yoga for well-being | do yoga! In our classes over the winter we’ve spent a few minutes each week practising Utkatasana – the Chair pose. This is a high squat with parallel feet with and arms either at shoulder height or overhead. It’s very good for us as it uses the large muscles of the legs and bottom to get the circulation moving around. Adding in the arms uses the shoulders and if you lift them overhead this uses the core muscles of the abdomen and back. So a really good all rounder exercise. But did you know that you can measure your fitness using the same kind sitting and standing up exercise? Watch the video below to find out how to test your fitness. As you will see experts agree that the Utkatasana-style movement is a great way to improve your fitness, especially strengthening your legs and lower back. So maybe have a count up? Let me know in class if you want to! For obvious reasons we need to have a good grip on the sole of the yoga sock – to stop us from slipping on our yoga mats! However, there’s an added bonus to using the socks in yoga postures because the toes are forced to spread and this gives us more surface area to balance on. So have a thought…TOE SOCKS… great idea and not just for yoga. I was inspired by Nigella Lawson for this recipe. Anything that looks like rice gets a massive thumbs down in our household as my husband thinks it tastes like gravel. So with rice and particularly couscous I have to work very hard with the flavours. And … he also finds pomegranate ‘over-rated pips’! As these are in the original recipe I substituted them with cranberries for a very favourable result. Place couscous into a heatproof bowl add salt, spices, raisins and 1 tablespoon of the oil. Mix to combine and then pour over the boiling water. Let sit for 5 minutes or so until all the water is absorbed. Fluff up with a fork adding in the remaining ingredients. Serve warm with a parsnip and chick pea tagine or cold with savoury pasties and salad. In our yoga classes this year we have been working with the Kapalbhati pranayama which serves to cleanse the lungs and nasal passages besides many other benefits. At this time of year with lots of colds around it’s good to try to keep ourselves as ‘pure’ as we can and this does mean cleansing the insides of our bodies – maybe just keeping hydrated with plenty of fresh water or perhaps following a few yogic techniques if we feel it’s right. Another practice we have done in class is the Lion’s Breath which stretches the tongue, cleanses the throat and gets all the breath out of the body in one long roar! Fun and cleansing too – well it makes me laugh! You can also use salt water (saline solution) to cleans the nostrils with the aid of a neti pot. This is particularly useful if you have a blocked nose, cold, sinusitis and can be helpful to relieve tension in the face and brow. “The breath is the most vital process of the body. It influences the activities of each and every cell and, most importantly, is intimately linked with the performance of the brain.” (Sw Satyananda Saraswati, APMB) Anything that impedes air from circulating around our bodies will have a far reaching impact upon our health, so it’s worth doing what we can to keep the air flowing. The practice of neti can be performed at home by anyone – except if you get regular nose bleeds. A special pot will be required – these are readily available from the internet. Always prepare boiled water mixing 1 teaspoonof salt per pint of water. Don’t be tempted to use less salt – this ratio is the same as our tears and is what the body is used to. If you use pure water it will sting. Allow the water to cool to blood heat. Fill a neti pot with the prepared water, tie hair back and lean over a basin. Begin to breathe through your mouth. Close the eyes and relax the body, tilt the head over to one side and gently insert the nozzle of the neti pot into the upper most nostril. The water will trickle through to the lower nostril and out into the basin. It may be a small trickle at first but it will unblock gradually. Once half the water has passed remove the pot and blow the nose gently. Repeat on the other side. Now the nostrils must be dried thoroughly – this is where some people make the mistake of skipping the process and that can result in worsening the problem not improving it. Stand up straight and close one nostril, blow the other nostril into a tissue 5 – 10 times in quick succession – rather like we do in Kapalbhati. Repeat on the other nostril. Now repeat on both nostrils again. Bend forward so that the trunk is horizontal, turn the head to the left for 5 breaths and then blow the nose rapidly as you straighten up to standing. Repeat turning the head to the right. Finally repeat the bending forward but keeping the head centred – 5 breaths still and then blowing the nose through both nostrils as you return to standing. The whole process takes about 10 minutes to complete and can be done daily until the nose is unblocked. If you get regular nose bleeds then don’t do this practice. If you find that the water does not run out of the nostrils then it’s best to see your doctor for further investigation as you may have a structural blockage. If you are unsure, work with a yoga teacher – there is instruction on line but often it omits the drying stage which is vital. 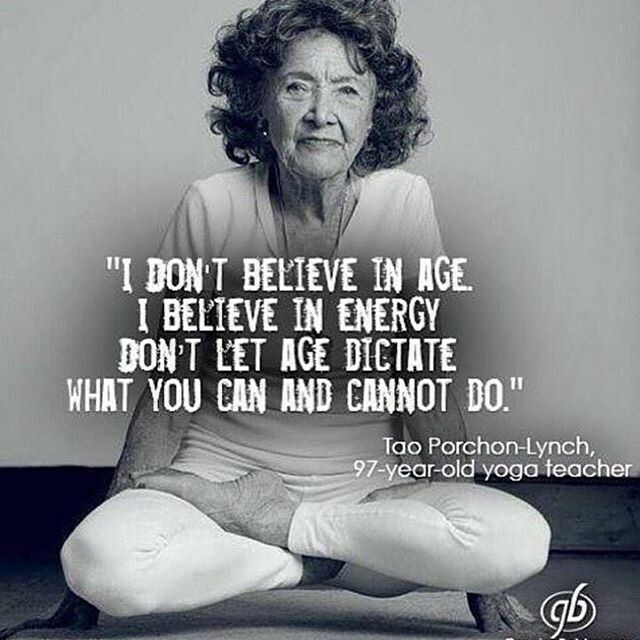 Age means nothing in yoga. Our bodies, if kept healthy and happy will go on and on, it’s something that even scientists are coming to agree with. The practice of yoga doesn’t have to take over your life, make you eat vegetarian or grow your hair long. Whilst there are some things that improve with age – decision making, empathy and happiness, there are a lot of things that do change as we get older that are not for the better; it doesn’t have to be that way. And it’s never too late to start… just so long as you make a commitment to practice regularly, little and often is the key. Problem – painful joints (especially hands and knees) can make us feel really stiff and creaky – making us grumpy as it hurts to do things we used to get pleasure from. How Yoga Helps – gentle regular movements help to bring synovial fluids to the joints making them feel more flexible and reduce swelling which relieves tension and pain. Problem – as we age our bone density decreases which means our bones are more likely to crack if we fall. How Yoga Helps – weight bearing exercises help to increase bone density. Although the gains are relatively small, these gains along with the improved muscle tone and balance can help to negate the effects of osteoporosis. Problem – as we age we need less sleep and can be woken with the need to go to the loo. How Yoga Helps – Gentle stretching and rhythmic breathing techniques can help to induce sleep. Relaxation exercises learnt in a class environment can prove very useful and help us get a full night of restful, healing sleep. Problem – High blood pressure is a common ailment affecting us as we age due to reduced elasticity of blood vessels and the decreasing ability to process dietary salt. How Yoga Helps – The regular practice of deep breathing and gentle physical exercises helps the tissues of the body to remain healthy and elastic. Attending classes helps people to look after themselves, be with like minded people, feel supported in adopting more positive approach to diet and lifestyle. Problem – menopause can cause debilitating disruption to life with wild mood swings and temperature fluctuations. How Yoga Helps – relaxation techniques and gentle flowing posture work practiced daily can help to decrease symptoms. Problem – a decrease in collagen produced by the body causes a loss of flexibility in our muscles and connective tissue, this leads to stiffness, tension and imbalance in the body. How Yoga Helps – gentle, regular stretching keeps the body’s soft tissue fluid and flexible. Problem – tears are common in stressed and overused ligaments of the knee joint, shoulders, hips and ankles. How Yoga Helps – by strengthening the muscles around these joints the stress is reduced on the ligaments and the joint is able to retain it’s healthy use. There is a saying in yoga ‘use it or lose it’ and the best way to keep joints moving is to keep joints moving. Problem – pain is caused by nerves being squashed by unsupported vertebrae. Gravitational forces and poor posture will continually cause vertebrae to want to move downwards. The only way to keep the spine in correct alignment is to support it with strong muscles. There are many spinal issues that can arise as we age – narrowing of the spinal canal, herniated, bulging or slipped discs – all cause back pain which is commonly managed with pain relief tablets. How Yoga Helps – gentle work to strengthen the back, core muscles (and really the whole of the body from the feet to the eyebrows) will help the back to be supported by muscle and bring about correct alignment to the spinal column. Abdominal breathing is the most efficient and natural way to breath. It’s great to watch dogs, cats and children sleeping and watching their little abdomens expanding and contracting with the breath – it’s nature – how we are all meant to breathe. However, it’s a technique that is forgotten by most of us by the time we reach adulthood. Tense abdominal muscles can be the result of continually holding the tummy in, tight clothing, poor posture, back ache or emotional issues. All of which are often totally unconscious. Once correct, natural breathing is restored and becomes part of your daily life improvements in health and wellbeing can be quite amazing. As breathing is the most vital process of the body, even slight improvements can give benefits to the practitioner. The breath influences the activities of each and every cell, and is intimately linked to the performance of the brain. Abdominal breathing is a preparatory practice for Pranayama (control of the life force) and encourages correct breathing. Slow, rhythmic breathing brings about a calm state of mind, which in turn calms the nervous system and leads to less stress in the body. Deep breathing in this manner increases absorption of energy into the body and keeps the heart healthy and strong. We practice abdominal breathing by enhancing the movement of the diaphragm and minimising the movement of the ribcage. I think it helps to visualise the air moving into the body through the nose and travelling down into the abdomen (this does not really happen) and then visualise the air travelling back up through the torso and out through the nose. This movement allows full use of the diaphragm and the lower lobes of the lungs to fill and empty (the parts that don’t get used fully when the diaphragm can’t move). Try practicing at different times of the day – when you have a little time waiting for something or when you are in bed last thing at night or first thing in the morning. Also try this type of breath in more difficult circumstances – say after a meal or when wearing a tight waist band, it will help you to appreciate where you are making life difficult for yourself! And finally, try this abdominal breathing when you are in a stressful situation and see if it works to reduce your anxiety. This year our yoga classes will revolve around the theme of OPPOSITES. This concept was used widely in yogic literature to help us understand ourselves and the world in which we live. Our first pair of opposites will be BIG and small. As always with Hatha yoga we begin with the physical body and using the body to explore ways of being big – like an Oak Tree or a Mountain and also being small – like a child, a bird or a seed. Moving from one to the other challenges our balance, and strengthens and stretches our muscles. We’ll work with the breath, expanding the lungs with physical moves and breathing exercises – discussing the benefits of large breaths vs small breaths and taking time to feel what this experience is like for us. 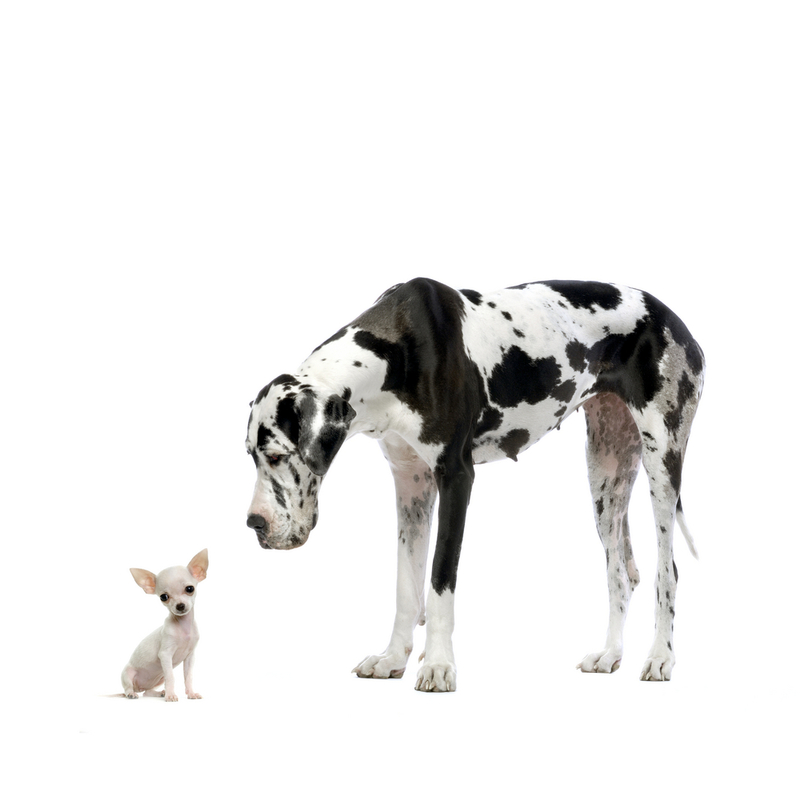 Throughout our work during the year there will be many ‘companion’ opposites – loud and quiet, easy and strained may well be other pairs as we develop our work with the breath.